SAS vs SAP BI vs Power BI | Which BI Tool Wins in 2019? It’s easy to get overwhelmed when choosing a BI software solution. Rest assured, the wide range of options on the market mean there’s a solution for virtually any company’s needs. In this article, we’ll be comparing SAS vs SAP vs Power BI — three leaders in the business intelligence field. Among the features that set each of these apart might be each program’s digital suite, the types of analytics offered by the systems, interactive dashboards and supply chain management features. The scope and scale of your business’ needs will determine the necessity of various offerings, and the information to follow will help you assist in your analysis for BI software selection. SAP BusinessObjects supports a storyboarding visualization platform complete with the capability to add images, text, infographics, charts and animations. Users can fine-tune their visualizations with filters and ad-hoc reporting functions, ensuring the desired data is illustrated. Additionally, mapping is enabled with geospatial integration abilities. The data visualization features of Microsoft Power BI rest on the concept of ease of use. Drag-and-drop capabilities and an open, customization-focused platform provide a user-friendly tool for report creation. A multitude of visualization options add to the simplified individuality offered by the system. Additionally, many of the tools share functionality with Microsoft Excel, so the majority of users will be able to learn the data visualization features quickly. SAS Visual Analytics illustrates data through appealing, interactive reports. Users can organize analytic findings into a dashboard view that includes standard report components like charts, images, text, as well as other elements including videos and web-based apps. SAS visualizations respond to changes in real time. Insights are brought to the forefront through sorting, filtering and one-click content linking. Additionally, users can open reports to comments from team members and continue edits on multiple devices. The reports update consistently, so a current version will always be available. Microsoft Power BI has the best data visualization platform among these systems, mainly due to its user-friendly interface. While the three tools share many of the same features that are common among most data visualization tools, Power BI’s ease of use really sets it apart. Data visualizations from Microsoft Power BI. SAP provides software programs that help businesses manage relationships with customers, examine the performance of marketing strategies, monitor finances and organize supply chains. The system offers analytics that evaluate the profitability of a company’s website. SAP’s software is also able to calculate the number of social media users who post comments about a business and the reach of those comments to the users’ contacts. SAP has the ability to track the number of visitors that a referring domain provides every day and the conversion rates particular sources of traffic generate. The systems can also identify the type of device and the browser that a customer is using. Furthermore, the programs can leverage interaction data to create heat maps which indicate sections of a webpage that customers have commonly clicked. The software can calculate pageviews and the percentage of guests who return to the website. Power BI was created by Microsoft and dovetails into Office 365 and Excel. The system lets users evaluate data, create widgets, modify dashboards, develop tables and rapidly receive data from numerous sources, all in one central platform. Moreover, the system calculates the inventory a business will require during certain time periods based on historical traffic and seasonal patterns. Power BI is able to send alerts when a company should order additional products. When managing inventory, Power BI can calculate the number of defective items each supplier sends and any financial losses precipitated by malfunctioning products. The program is also able to determine the downtime incurred by defective items to curb complications in the future. SAS programs can extract information from multiple sources, offer detailed models that illustrate trends, create forecasts and automatically generate updates for reports. The system generates detailed analytics that can identify keywords commonly contained in posts and calculate the percentage of comments with a positive tone. In addition, the program is able to provide a feed of comments from all social media networks whose records will indicate the time each comment was added as well as the number of followers that the poster’s account has. This allows a business to gauge reach and impact of customer satisfaction. SAS Institute’s software provides comprehensive dashboards that analyze the demand for certain products and the overall supply of the items. The system can then predict increases in the market values of goods and services to help aid in forecasting for sales and inventory purposes. An analyst may also conduct hypothetical simulations in order to determine how various events could affect a product’s value. By using SAS Institute’s programs, a company is able to perform split tests which allow analysts to simultaneously determine the revenue that multiple strategies can produce. The program can also generate charts that indicate the historical return on investment that each marketing strategy provides. In head to head comparisons, SAP vs SAS and Power BI has the best analytics platform among these three vendors. The predictive abilities, support of unstructured data and other features place SAP at the top of these tools in the category of analytics. An example of analytic tools from SAS. Multi-dimensional analysis through SAP BO is made possible through the software’s calculation, trend forecasting and data modeling features. 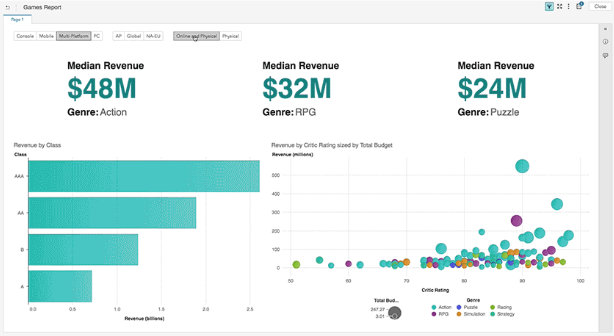 Microsoft Power BI hosts a standard OLAP platform that connects to SQL servers for multidimensional analysis, enabled via data drilling tools. SAS Visual Analytics users can organize data into a hierarchical format. With OLAP functionality, users are able to drill into the layers of those hierarchies to observe possible interactions. SAS describes the software’s drill-down capabilities as “self-service,” free of preset exploration paths. In a comparison between SAP vs SAS vs Power BI, all three tie in regards to OLAP functionality. All three systems host similar OLAP platforms, without one having a clear advantage over the others. SAP reports can be distributed via email, online platforms and mobile devices in a variety of file formats. Supported file types include PDF, TXT, XLS, XLSX and CSV. The Lifecycle Management Tool of the software handles version control functions. It may go without saying, but Power BI reports can be easily converted into Microsoft Office files, e.g. Word documents and Excel spreadsheets. The program does not support versioning. Reports created in SAS Visual Analytics are able to be exported in the form of PDFs, CSV files, images, Excel spreadsheets and other document types offered through Microsoft Office. SAP’s document management capabilities are superior when comparing Business Objects vs Microsoft Power BI and SAS. The program’s support of versioning is the differentiating factor when comparing the systems. SAP provides multiple support channels, along with a partner network and training courses. With these features, SAP offers a system that helps users learn the software and make the most of their experience. The SAP support suite includes SAP Enterprise Support, which is meant to guide business practices. Standard technical support and troubleshooting is provided through the SAP Support Portal. For product information, users can turn to the Help Portal. Digital Business Services provide a point of contact via email, phone and Twitter for all BusinessObjects-related inquiries. SAP also provides a comprehensive security system designed to protect user data. Microsoft Power BI has a network of partner businesses that provide knowledge and consulting services to users. Companies such as Dell, Launch Consulting, Peters & Associates, DB Best Technologies LLC and over 300 other firms have partnered with Microsoft to bring their benefits to users. In addition to the partner program, Power BI supplies a support network that consists of traditional support resources and community forums, along with educational tools. Guided lessons, sample Power BI files and informational pieces give users tools for learning the system. SAS advertises a service system consisting of training, support, consulting and partners. The system aims to provide users with the assistance and knowledge needed to fully utilize the software. The SAS partner network includes Accenture, Cisco, Hewlett-Packard, IBM and Intel, among a number of other international corporations. Comparing Power BI vs Business Objects and SAS, the decision services of Power BI come out on top, particularly due to the software’s partner network. The connections provided by a Microsoft-based platform are obvious when evaluating this feature. SAP utilizes APIs to create embeddable applications. BusinessObjects has a network of system add-ons to enhance the functionality of the software. This includes extensions to aid in scheduling, testing and reporting, among many other tools. Additionally, SAP advertises the Microsoft Office integration abilities of BusinessObjects. The software accesses and analyzes data from Excel. Users can also connect SAP BusinessObjects to PowerPoint to display data findings in presentations. Microsoft Power BI continually adds data sources and embeddable programs. Some of the applications listed on the vendor’s website include Google Analytics, Oracle, Salesforce, Github, Facebook and, of course, other Microsoft tools such as Excel, SharePoint and Access. Connections with ERP and CRM systems, as well as Microsoft Office programs, are simplified by SAS Integration Technologies. This feature taps into the functionality of APIs and embedded data to enable seamless integration with outside software. An added benefit is message integration, which uses Java Message Service to connect SAS to any messaging application. When comparing Power BI vs SAP BI or Power BI vs SAS visual analytics, Power BI comes out on top for hosting the most comprehensive integration system. This is another feature that demonstrates the benefits of Microsoft backing — integration is simplified when the majority of programs already have some form of Microsoft collaboration. Data sources provided by BusinessObjects include SAP’s own Business Warehouse and SAP HANA, along with outside sources such as Apache Hadoop, Apache Hive, Hbase and Cassandra. Additionally, integration with Amazon Elastic allows for collaboration with MapReduce Programming. Analytic functions and consulting services offered by SAP reveal trends, forecast possibilities, assist in planning and identify opportunities associated with Big Data. The vendor also hosts a number of Big Data-focused educational resources on their website. With its multiple linking capabilities within the Microsoft space, Power BI is capable of extracting information from multiple data sources that utilize various formats, combining it into a central database where an analyst can leverage data by common keywords and trends. Additionally, users can eliminate the negative impact of analytical anomalies or narrow down data. Information can be sorted by demographic attributes or geographic region in order to drill down to the most relevant data for actionable reporting. SAS business intelligence users (or anyone visiting the vendor’s site) have a library of Big Data information, as the software company provides a wealth of articles to consumers. In relation to the actual Big Data functionality of the system, Hadoop, Hive, Hbase and MapReduce are some of the databases SAS is able to access. ETL (extract, transform and load) data management is a notable feature of SAS Big Data integration. Similar to the software integration abilities of Power BI, the system’s Big Data integration tools are superior due to the built-in connectivity of a Microsoft platform. A view of data extraction functionality provided by SAP. SAS offers software that provides advanced analytics, and the program generates especially detailed graphs and other data visualization capabilities. According to many reviews, the system also produces predictive statistics that are slightly more comprehensive than the forecasts of SAP’s software. Additionally, the program can easily be connected to many platforms that manage information. SAP’s system features a large number of custom APIs and modules that can combine and leverage many types of information. The software can rapidly modify the format of data to ensure the information is integrated into detailed charts, maps and tables. The system also has numerous tools that let users schedule tasks and create well-organized lists of completed projects. Microsoft Power BI is substantially more cost-effective than its counterparts. Power BI also offers easy-to-use dashboards that can be customized, as well as the ability to regularly generate basic reports more swiftly than most other software programs. The integration abilities facilitated by the Microsoft platform allow users to embed Power BI into a number of programs, and extract data from multiple sources. Ultimately, the software’s data visualization tools, decision services and integration functions place Power BI as more advantageous than SAS Visual Analytics or SAP Business Objects, in relation to the listed features. As evidenced by these comparisons, no BI solution is one-size-fits-all. However, the space offers many options with available customizations to accommodate the needs of virtually any type of business. Comparing these features is vital to finding the perfect fit for your organization. Does your business use SAS, SAP or Power BI? Are you thinking of implementing one of these systems? Leave us your thoughts in the comments! Very obvious that you are promoting Power BI. Why don’t you discuss the weaknesses of each product as well..? We are an unbiased company, so we don’t promote any particular vendor over another. Our experts’ analysis simply showed that Power BI was the better system.